People with Sjögren's syndrome can have nerve problems. When they do, the problem usually involves the peripheral nervous system (PNS), which contains the nerves that control sensation and movement. Involvement of the PNS is increasingly being recognized. Carpal tunnel syndrome, peripheral neuropathy, and cranial neuropathy are examples of peripheral nervous system disorders that occur in people with Sjögren's. 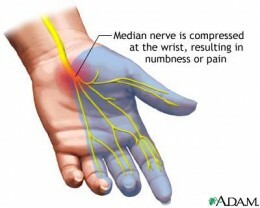 In carpal tunnel syndrome, inflamed tissue in the forearm presses against the median nerve, causing pain, numbness, tingling, and sometimes muscle weakness in the thumb and index and middle fingers. In cranial neuropathy, nerve damage causes face pain; loss of feeling in the face, tongue, eyes, ears, or throat; and loss of taste and smell. Nerve problems are treated with medicines to control pain and, if necessary, with steroids or other drugs to control inflammation. Inflammatory neuropathies can be caused by an autoimmune process. The immune system begins attacking the nerves, which causes neuropathy. Symptoms are explained as burning, tingling or numbness. They may also have motor symptoms like muscle weakness. It may be contained in the arms or legs or more widespread. Polyneuropathy is when multiple peripheral nerves become damaged, which is also called peripheral neuropathy. Peripheral nerves are the nerves outside of the brain and spinal cord. They relay information between the central nervous system (brain and spinal cord) and other parts of the body. Polyneuropathy means several nerves in different parts of the body are affected at the same time. Polyneuropathy can affect the nerves responsible for feeling (sensory neuropathy), movement (motor neuropathy), or both which is called sensorimotor neuropathy. It may also affect the autonomic nerves which control functions such as digestion, the bladder, blood pressure, and heart rate. Mononeuropathy means one nerve is affected. Peripheral Neuropathy Tips from Sjogren's Syndrome Foundation. Small Fiber Neuropathy in Sjogren’s Syndrome: A Review. A lack of uniform diagnostic criteria for small fiber neuropathy and Sjogren’s syndrome presents several challenges for treatment. When the Carpal Tunnel is inflamed from irritation, it can put pressure on the Median Nerve that goes through the tunnel.